The VVV Survey data products offer a unique dataset to map the stellar populations in the Galactic bulge and the adjacent plane and provide an exciting new tool for the study of the structure, content and star formation history of our Galaxy, as well as for investigations of the newly discovered star clusters, star forming regions in the disk, high proper motion stars, asteroids, planetary nebulae, and other interesting objects. The VISTA Science Archive (VSA) is part of the Wide Field Astronomy Unit (WFAU) at the Institute for Astronomy, the University of Edinburgh. It holds the image and catalogue data products generated by VIRCAM on the Visible and Infrared Survey Telescope for Astronomy (VISTA) . The primary contents of the archive originate from the VISTA Public Surveys. Survey science-ready catalogue data will be released in phases, while standard flat-file data products (both images and derived single passband catalogues) become available continually after routine observation and processing operations. (v) producing virtual observatory (VO)-compliant data products for delivery to the ESO archive. Figure 1 shows a flow chart of the data processing. The pipeline products are: astrometrically corrected and photometrically calibrated tiles in each filter used, confidence maps, and homogeneous object catalogues (Cross et al., 2009). The pipeline records the processing history and calibration information of each file, including calibration files and quality control parameters. 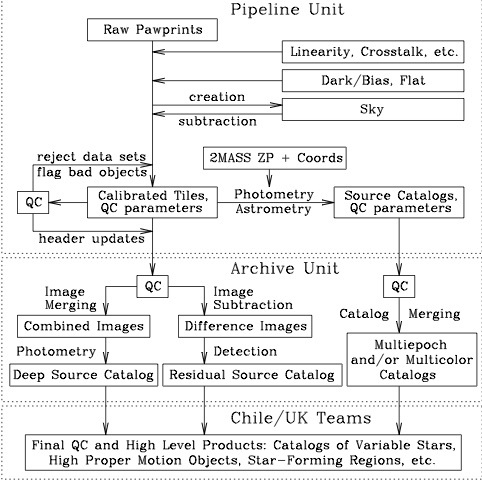 The Cambridge Astronomy Survey Unit (CASU) component of the VDFS will be responsible for the basic pipeline processing and the first calibration, all done on a daily basis. (iii) light-curve extraction: this will be done by implementing an image-subtraction algorithm (Alard & Lupton, 1998; Alard, 2000), which will allow us to create the catalogue of variable sources. This method provides excellent results for crowded fields in which the traditional aperture or PSF-fitting photometry fails (e.g., Kaluzny et al., 2004; Pietrukowicz et al., 2005). (3) The VISTA Data Flow System (VDFS) is a collaboration between the UK Wide Field Astronomy Unit at Edinburgh (WFAU) and Cambridge Astronomy Survey Unit (CASU), coordinated by the VISTA PI and funded for VISTA by the Science and Technology Facilities Council.